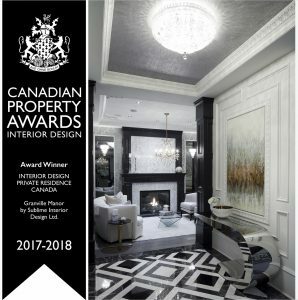 We are proud to announce that our project Granville Manor is a Winner of the “Interior Design Private Residence Canada” of the Americas 2017 awards presented by International Property Awards! The Granville Manor is a 7,438 square foot home that boasts a luxurious ambience that is reminiscent of the traditional Italian, French, English influences with a modern and contemporary twist. It is located in the heart of the historic neighborhood in West Granville, Vancouver. The Granville Manor has previously been nominated for many awards and has won select categories in the Ovations Awards and Georgie Awards that celebrate excellence in home building and design in British Columbia, Canada. It has received lots of positive feedback and love, and has been proved as a client favorite. The property has also been selected to be published in a book “Pacific Northwest Homes” coming out soon.